and she explained, “this is my saliib (Arabic word for “cross”) and I want to show the kids at hadaana (Arabic for “preschool”) my saliib on my hand.” The unspoken words which I added were, “because all of the kids and teachers at hadaana have saliibs on their hands.” Makes sense. Poor little Emma is the only one there without a tattoo of a cross on her wrist. I never thought of it before. I had thought many times, I wonder when the day will come when she comes home begging to get her ears pierced because she’s the ONLY girl without pierced ears in the whole country! I didn’t anticipate that sending her to the Coptic Church preschool would mean she was the ONLY person there without a cross on her wrist! 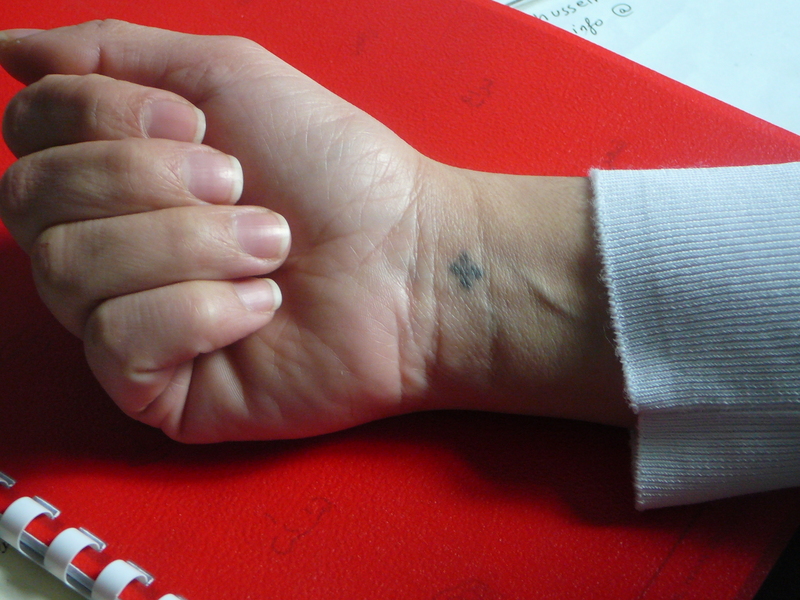 You see, many Christians in Egypt tattoo a small cross on the inside of their right wrist to identify themselves as Christians. It’s a nice symbol which a friend commented on the other day, “I like the idea that no one can take this cross away … they may be able to take the cross off my neck, but can’t remove it from my wrist.” I’m not sure if there is a general age at which this is done, but the kids in Emma’s class are 3 and 4 years old, so it’s done quite early. So, I told Emma that her cross would probably come off her wrist before she returns to hadaana in a few days, especially when she gets a bath. I told her that the kids at her school had to get a needle to get their crosses so they don’t come off. She really wanted to show the kids her saliib, though, so I told her that we could give her a new one the morning she goes to hadaana. Jayson did the honors and she was very excited about showing the kids and teachers her cross on her hand. I wonder how the kids reacted. Had they noticed she didn’t have one? Did they even think about it? Did they think it strange that she showed them her saliib? It’s just a natural part of who they are, and they wouldn’t think of showing it off to others; yet perhaps it is a symbol of pride right after they get it done? There are many things that I don’t know. I am guessing the teachers understood the peer pressure factor of Emma being the only child without a cross. I’m not sure we’ll do it for her again, or if she will kind of forget about it, but it was an interesting experience. 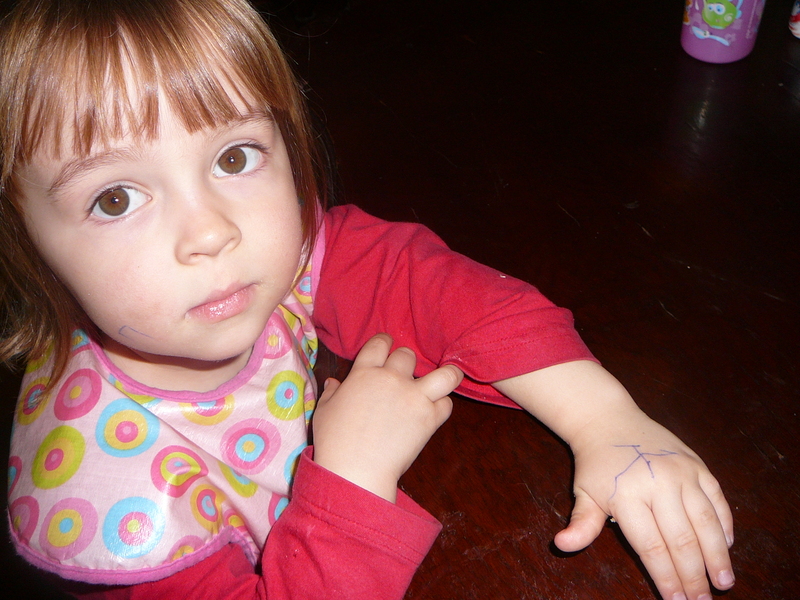 I’m not ready for her to get a tattoo at age 3, but I was much happier that she wanted a saliib on her hand than holes in her ears, although I’m sure that will be coming in the near future. Love the story, My maltese friend Claude laughed because he saw the title, in Maltese Saliib means cross as well, but it also means burden, it also means that someone is a burden or a difficult person. Anyway, love the updates, I hope that your doing good. Awwww. Sweet story! I can’t believe how big Emma has gotten. She and Hannah are beautiful little girls! Cute article and kid! I never realized that this was done by Egyptian Christians…I’ll have to see if my Egyptian friends here in Amman have them too!